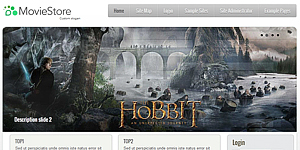 how can i use this template for joomla 2.5? Movie store template is very nice. However, I have been trying to change the slide show caption. Could not figure out how to do it. Hope I will get some help. Nice template! But adding pics in the slideshow doesn’t seem to work with me… Some help would be nice? Very nice template. A few problems though. If we want no slide description and no slogan (we’d rather use our own colors and texts embedded within the images) it defaults to the show settings and it becomes very annoying. Because of the formatting of text even leaving them only with a “.” stands out too much. If you get rid of this or show how to do this then it would be a much more seriously good template. Second thing is logo height. It is rather short and cannot be changed, or how can it be? Maybe to these changes and then it will really be good. Maybe these comments will help with other existing templates too or future ones. Thank a lot for an otherwise very nice and simple template. I am very grateful for your template moviestore. But do you have any contact form on your webside? In http://joomlaskins.net/terms-and-conditions/ you say something of a contact form, but I cannot find it… ?! This implemented banner is now suddenly not working anymore and I am trying to find out why?! Hi, Do you mean the main menu background? That is in the styles.css file. You have changed something there.